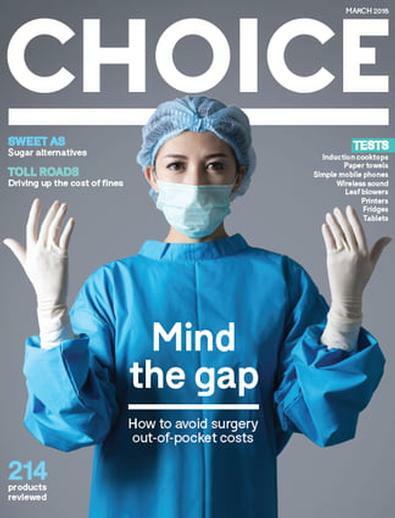 A trusted Australian favourite since 1959, Choice magazine is the best source of expert, unbiased reviews, testing and analysis of a range of products and services. Completely independent, every issue provides up-to-date, relevant information and advice that allows consumers to make informed decisions. With no advertising or sponsorship, readers can be assured they will find honest reporting, rigorous testing and unbiased ratings in categories that include home and living, electronics and technology, money and finance, shopping, health and body, food and drink, travel, babies and kids, home improvement, transport and outdoor. Regulars include Checkout with news, views and product sneak peaks, Ask The Experts for insight to your personal questions and The Shonky Awards which highlight questionable products, rip-offs or plain, dishonest behaviour. Buy with confidence every time! CHOICE magazine was established in 1959 and has been helping consumers make better purchasing decisions and get value-for-money on products ever since. At CHOICE we pride ourselves on delivering expert, unbiased information you can trust. As a completely self-funded and 100% independent body, we rely on membership subscriptions to enable us to act in a truly credible manner. Choice has always been a goto for independent reviews of consumer products, and for consumer advocacy articles. You do have to take their reviews with a grain of salt though, and they do have their biases. Miele always comes up best for home appliances, regardless of the cost, ditto iPhones, even if an Android phone outshines them in nearly every department (iPhone will get over the line with a top &quot;ease of use&quot; score, meaning testers use iPhones). Reviews can also reflect lay not expert opinion, but on the whole a great mag, with better reviews than many so-called independent reviews on the web. Such an excellent magazine. As a previous review said, we always consult Choice for independent, unbiased reviews before purchasing products. Great up to date information. Always consult choice before making any purchase. Insightful and reliable. A very trustworthy source of info. I loved your recent test on espresso machines, it really helped me find a good one. Thanks CHOICE!